Hi, there, I’m Gin Ferrara, the Community Engagement Manager at Regional Educational Television Network (RETN) and Partner at the Vermont Story Lab. Part of my regular work is spreading the word about our programs and services to our community. This includes sharing videos, photos, events, and blog posts across social media platforms. I’ve put some of my own lessons learned into a 3-hour lab for Vermont Story Lab, “Top Tips for Digital Media Outreach,“ and this post shares a few of the tech tips for media making. 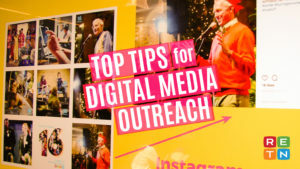 This blog is the second of 2 — see my tips for thinking about the big picture of digital media outreach in my first post. For my video, “On the Road with Food Allergies,” I edited the original image in PicMonkey to boost the color and add a vignette. I then opened it in iMovie, made a 10 second video clip, and exported the video. I then brought the video into Vont, where I made titles with fonts and effects. Here’s a list of some programs that we’ve tried – I recommend playing around with ANY app for a little while before using it for an outreach campaign! WeVideo – Desktop and mobile video editing, works on PCs and Macs, low-cost with many options. PicMonkey – Robust desktop photo editing, also includes layout and graphics. Free and $ versions. Adobe Spark – Desktop and mobile app for simple video and design templates. Stock photo and music included. Canva – Robust design templates for web and print graphics. Mobile version for Apple. YouTube Editor – Royalty free music and sound effects for videomakers with a YouTube Channel. iMovie – Simple but thorough video editor for iPad and Mac (desktop version too). GarageBand – Music composition and audio recording for iPad and Mac. Typorama – Make dynamic quotes with text editor for iPads and iPhones. Free version has watermark. PicLab – Photo editor and graphic layout for iPad/iPhone. Free and $ versions. Paper – Hand-drawn images with multiple pens, palettes. Free and $ versions. Vont – Titling tool for iPad, create moving, layered text on video. $ version only. *User beware! FREE isn’t always free – there may be a watermark, annoying pop-up ads, or an inability to share your design. Even paid apps often have some limitations over the full-featured desktop software most professional designers use. 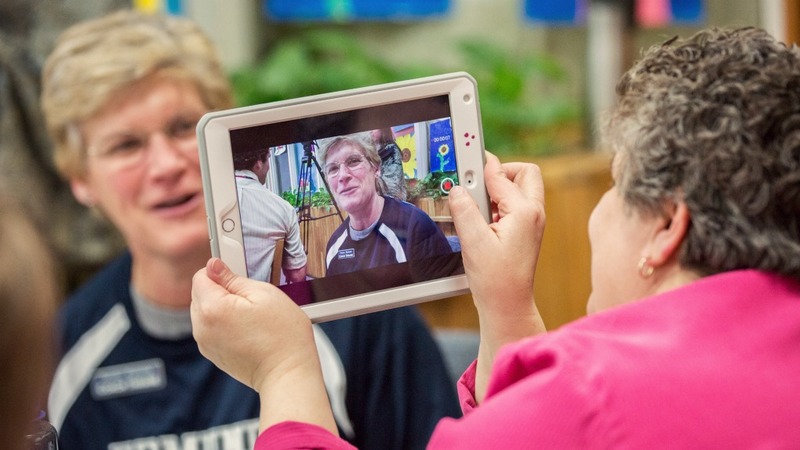 Teachers in RETN’s iPad videomaking workshops practice recording video horizontally. When creating images for outreach, use the best quality settings on your device, and shoot/record horizontally. You can always crop later, but most web image frames are horizontal (or square) as the default. Video frames are a 16:9 ratio, while photos are often 4:3. You can crop your images in most editor apps to these standards. There’s no point creating an awesome digital media plan if you can’t find your photos, right? So from the get-go, make folders that clearly name your campaign, and make it easy to find your files. Once you’ve created media on a mobile device, save all your original files and the finished product to safe storage (your cloud drive, Google Drive, and/or your desktop computer) and clear your device so you have room to make more! But HOW do I make a video? Check out RETN’s workshops, offered year round. This is just the tip of the iceberg! Learn more about telling your story online and with impact at the Vermont Story Lab statewide summit! Helping other people tell their stories gets Gin up in the morning. She is the Community Engagement Manager at Regional Educational Television Network (RETN). Gin is also a multimedia storyteller, the co-founder of Baltimore's Wide Angle Youth Media, the owner of communications design company Spindle & Widget, and a co-host of the monthly live story event, Storytelling VT.